Offering you a complete choice of products which include canopy tent, conical tent, hut shape tent, printed tent, promotional display tent and display tent. We are offering Canopy Tent to our clients. The tent will consist of a roof, 3 top facias, 1 backdrop & 3 bottom walls of size 4'x 2.5' height each. The roof & the bag of the tent will be made up of Imported Tetrone (PVC Coated fabric) in any desired color of your choice. 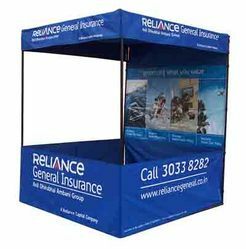 The top 3 facias, Backdrop & bottom 3 walls of the tent will be made of heavy duty Flex with solvent printing done as per your design (any visual/ image/text/logo is possible to print ). We are offering Conical Tent to our clients.The size of the tent will be 6’ x 6’. The centre height of the tent will be 9.5’ & the side height will be 7’. The tent will consist of 4 top cones, 3 top facias, 3 bottom walls. The bag of the tent will be made up of Imported Tetrone ( PVC Coated fabric ) in any desired colour of your choice. The top 4 cones, 3 top facias, and bottom 3 walls will be made up of heavy duty Flex with mild solvent printing done as per your design ( any visual/ image/text/logo is possible to print ). The tent will be put over a CRC powder coated frame, 25 mm O/diameter, made in sections for easy packing & carrying. The sockets of the frame will be made of M.Steel & will be powder coated. 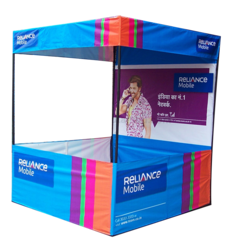 Hut Shape tent is an outdoor Advertising solution that allows you to promote your business/ products in outdoors and exibitions as well. 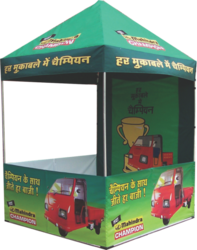 We are highly engaged in manufacturing and supplying the wide assortment of Printed Tent. These are used for providing shades in beaches, gardens and many other places. 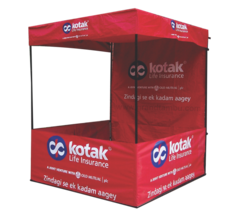 The offered range of Printed tent is available in various elegant designs, colors, conical shape & patterns which are easy to install due to light in weight. Our firm is expert in handling bulk orders as per client’s specification. 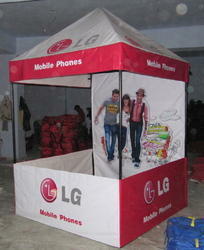 We are offering Promotional Display Tent to our clients. The tent will be made up of Imported (PVC Coated fabric) in any desired color of your choice. The tent will consist of a roof, 3 top fascias, 1 backdrop & 3 bottom walls of size 4' x 2.5' height each. The top 3 fascias, Backdrop & bottom 3 walls of the tent will have screen printing as per our design (no visuals or halftone jobs). The sockets of the frame will be powder coated. The tent will be packed in a carry bag made of the same material as the tent. We are offering Display Tent to our clients.The tent will be made up of Imported (PVC Coated fabric) in any desired colour of your choice. The tent will consist of a roof, 3 top fascias, 1 backdrop & 3 bottom walls of size 4' x 2.5' height each. The top 3 fascias, Backdrop & bottom 3 walls of the tent will have screen printing as per our design (no visuals or halftone jobs). The tent will be put over a CRC powder coated frame 25 mm O/diameter, which will be made in sections for easy packing & carry. The sockets of the frame will be made of M.Steel & will be powder coated. The tent will be packed in a carry bag made of the same material as the tent.